US stocks are moving toward all-time highs despite the trade war with China. That's because investors are thinking long term, according to Mohamed El-Erian, chief economic adviser at Allianz. "Ultimately, this is going to be resolved in a way that still leaves a free but fairer trade system," he told CNN's Alison Kosik on Wednesday on "Markets Now." That doesn't mean there won't be some volatility along the way. "The journey there is going to be incredibly noisy," El-Erian said. The trade war ratcheted up again this week. The Trump administration said it will impose tariffs on $200 billion in Chinese goods starting Monday, sharply escalating penalties against Beijing. China plans retaliatory tariffs on US products worth $60 billion. El-Erian said he does not expect the trade war to become a permanent fixture of markets and the economy. "I doubt it will last years and years," he said, citing the political calendar. "I think this is something that will get resolved in the next 12 months." That's a different view from that of Jack Ma, the founder and executive chairman of Alibaba. He said this week that the US-China trade war will last not for 20 months or 20 days, but "maybe 20 years." 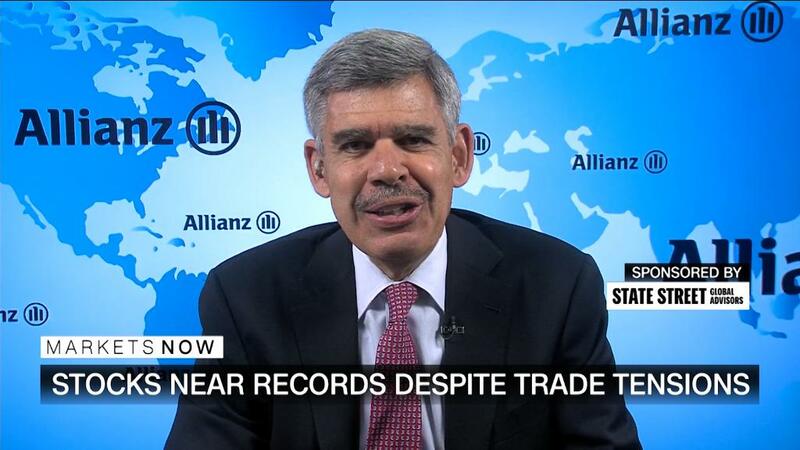 From El-Erian's perspective, the biggest threat to markets is not trade, but the diverging pace of global growth. He said the United States will continue to outpace Europe and Japan, and the Fed will move more quickly than other central banks to raise interest rates. El-Erian said this will lead to "even greater tensions on interest rates and greater tensions on the exchange markets." "Markets Now" streams live from the New York Stock Exchange every Wednesday at 12:45 p.m. ET. Hosted by CNNMoney editor-at-large Richard Quest and CNNMoney's business correspondents, the 15-minute program features incisive commentary from experts. Have an investing question? Ask us here to be included in a future story.